For many years, South Sudan has suffered from food insecurity. Recently, conflicts and overall instability have exacerbated the crisis in the world’s youngest nation. Key to reversing this trend is supporting local organizations and farmers to carry out successful agribusinesses. That is why today NGOs Cordaid, Agriterra and SPARK launch the South Sudan Agribusiness Development Project Phase 2. Currently, the majority of households in South Sudan rely on subsistence farming. This is the result of a lack of access to capital, quality agricultural inputs, storage facilities and limited knowledge on improved farming techniques and farming as a business. At the same time, recurring conflicts and natural disasters deepen the protracted issue of food insecurity. With the generous support from the Embassy of the Kingdom of the Netherlands in South Sudan to phase 2 of the South Sudan Agribusiness Development Programme, a consortium of NGOs will start a project to support 10,000 farmers and their agribusinesses. This will contribute to a brighter future with better food security and self-reliance for many South Sudanese citizens. The five-year project run from 2019 to 2023, with a total budget of 11 million US dollars (10 million euros). 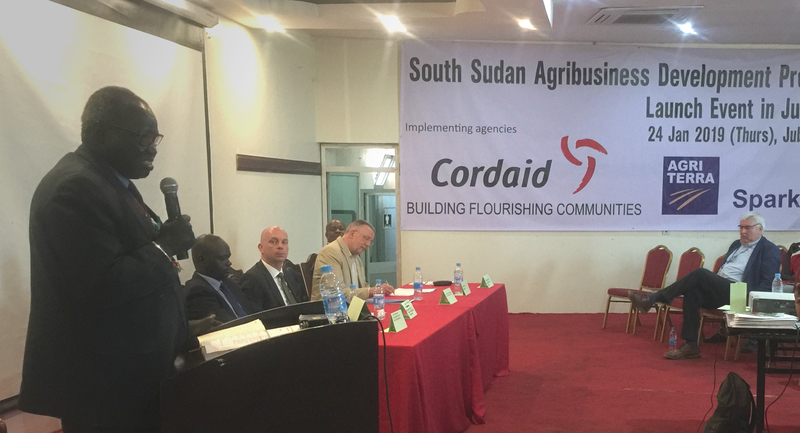 The Minister of Agriculture and Food Security of South Sudan officiated the Launch of the SSADP II project on 24 Jan 2019, Juba. The project is part of a larger initiative, called the Partnership for Resilience and Recovery (PfRR). In this partnership, donors and agencies exchange experience, work together and strive to achieve a common agenda in so-called hubs of stability. 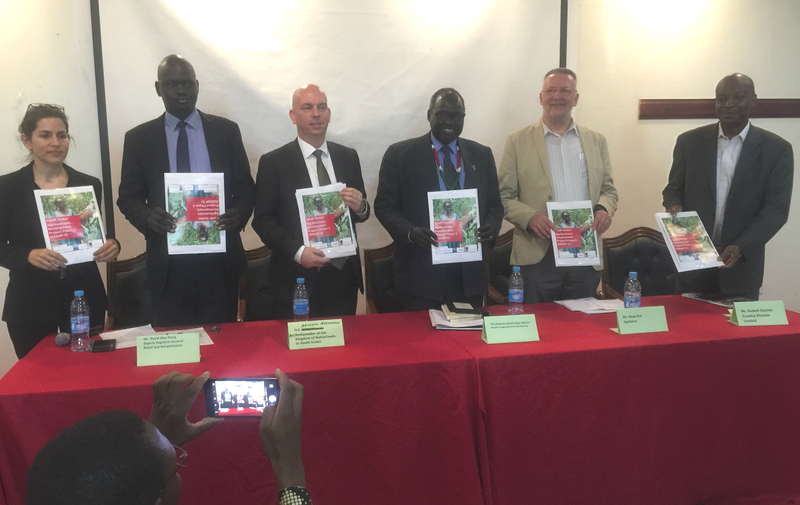 The project will be deploying activities in four hubs: Yambio, Torit, Bor and Rumbek. The initiative will also work closely together with another Dutch-funded PfRR initiative, the WFP Feeder Road Improvement and Maintenance Project. This collaboration will further maximize the results of the initiative. The Agribusiness programme is implemented by Cordaid, SPARK and Agriterra. Cordaid, the lead agency, has been working in South Sudan for the last two decades, supporting and implementing programmes in resilience building, emergency aid, health care and security and justice. Agriterra and SPARK both have proven experience in working with agricultural cooperatives and providing business development services. The guests who kicked-off the start of the project: Left to right, Lauren Servin, Interim Country Director, SPARK; Mr. David Aleu Deng, Deputy Registrar General of Relief and Rehabilitation Commission; The H.E. Jeroen Kelderhuis, Deputy Ambassador of the Kingdom of Netherlands to South Sudan; The Hon. Onyoti Adigo Nyikwec, Minister of Agriculture and Food Security; Hendrik Pot, Business Advisor, Agriterra; Hubert Charles, Country Director, Cordaid South Sudan. The programme improves and strengthens local markets and makes them more inclusive and accessible for agribusinesses. Additionally, the programme has a particular focus on supporting youth and women to start their own businesses. The launch event on the 24th of January signifies the collaboration among the implementing agencies with the line ministries, UN agencies, international and local NGOs, and the private sector. All stakeholders believe that through their joined efforts, they can unlock the potential of South Sudanese farmers, both men and women. Once they have become the building blocks of food security in South Sudan, they will also contribute to a more stable, peaceful and prosperous nation. The launch of the SSADP II programme was officiated by the Hon. Onyoti Adigo Nyikwec, Minister of Agriculture and Food Security of South Sudan, the Hon. Paul Mayom Akec, Minister of Trade, Industry and EAC Affairs of South Sudan, Mr. David Aleu Deng, Deputy Registrar General of Relief and Rehabilitation Commission, and the H.E. Jeroen Kelderhuis, Deputy Ambassador of the Kingdom of Netherlands to South Sudan, in Juba, witnessed by distinguished guests from World Food Programme (WFP), Food and Agriculture Organization (FAO), United Nations Development Programme (UNDP), and partner agencies.